The purpose of this web-site is to provide important information about using Light-Emitting-Diodes (LEDs) for health benefits when applying them safely to our bodies. 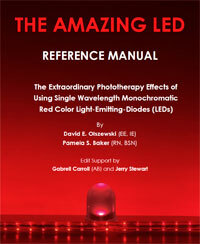 We are providing this information in the form of a Reference Manual called “The Amazing LED” which is available to read on-line and can be down-loaded in .pdf format – absolutely free of cost by clicking on the cover image in the right-hand column. We have been involved with Light Energy and Light Therapy for almost 30 years and have since retired. When one looks back on their life, this time, and asks those two very important questions – “What Have I Learned?” and “Who Did I Help?” – then bringing the Light Therapy knowledge to people ranks right up there in answering these questions! Therefore, we wish to pass along to everyone, everything we have learned about LED Light Therapy during these 30 years! The original version of this manual was created in 1988 when there was very little public awareness of LED technology and very few techniques to use it. Since that time to the present, there has been a significant increase in available products, the number of companies that are producing them, and the identified or published medical results from using LEDs. However, the vast array of products now available has in turn, proved to be confusing to the potential user and furthermore, there is still very limited (and confusing) information on how to use them. Note: we do not recommend any specific company or product. We are providing enough information to allow individuals to decide which product they want themselves (refer specifically to Chapter 5). Regardless of the specific products used, this document will provide a wide range of detailed application techniques and many that are unavailable elsewhere. The techniques and results described in this publication represent observations, anecdotal reports, plus personal and practical use by thousands of individuals since 1969, when the first patents for LEDs were established in the United States and since 1988, when this manual was first issued. We want to emphasize that we are not licensed medical doctors. We are neither diagnosing, treating, curing, prescribing nor preventing any illness or disease. We are not licensed in any medical field and we encourage you to seek or continue using licensed medical help with your problems. Under no circumstances do we recommend that you should use this information in place of your normal medical treatment. Simply use it as a supplemental procedure to the normal medical treatment. You should always consult with your physician. After consulting the Reference Manual, if you still have any questions, you can send your LED questions along with your name, e-mail address, and telephone number* to us, using the Contact Us form. *Sometimes the answer requires more effort than we want to spend typing it into an e-mail and we would then call you instead. Our work during the 30 years actually encompassed the larger field of Light Energy and Light Therapy, which included dealing with Sunlight, Artificial Lighting, Full Spectrum Lighting, Photo-Therapy, and their effects. These LIGHT topics are addressed briefly in Part 1 of the reference manual. In addition, you can read more about each of these light topics plus Thermo (Heat) Therapy in the Educational Briefs sections of this web site. We also have the pleasure of being contributing authors of one of the books on the use of light in medicine today –namely Light Years Ahead.